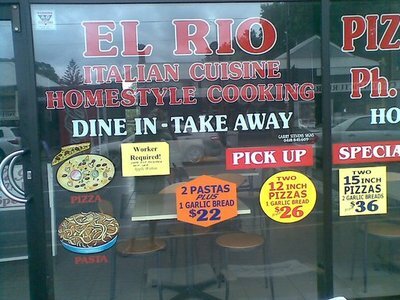 I have ordered pizza from a shop called El Rio for so many years. The pizza made there is to die for. It just may be the best pizza in Adelaide. It's a little shop located at 163 Magill Road, Maylands, nearly opposite Richards Park. The minute you walk into the shop you are greeted by friendly faces, who don't mind having a chat with you while making your pizza. El Rio is the type of shop you order takeaway, but if you prefer, they do have seating arrangements for you. Not many people know about El Rio, because it is small and a bit hard to find, but the minute you do find it you won't stop getting pizza from them. They have a selection of pizza dishes to choose from as well. I really, really, really love El Rio, so I give it a rating of: 5/5!